When we met the folks at RISE Armament at SHOT in January, they were nice enough to invite us to the Oklahoma Run and Gun competition. The competition sounded like a lot of fun and … made for a great excuse to build a new rifle. The Oklahoma Run and Gun is a 5k or 10k race that combines physical obstacles and challenges with shooting targets out to 500 yards. Competitors are required to carry a center fire rifle and pistol, ammunition for each and any other gear or water they need for the race. The race is held in mid-July so water is critically important. The first challenge: Build a relatively lightweight, yet accurate, rifle for run and gun style competitions. This article will be the first in a series of three. In this installment, we’ll list out the various parts, prices and reasoning for each. In the following installments, we’ll document assembly of the upper and lower of our Run and Gun AR-15. Yeah, we know, everyone and their brother has done AR-15 build articles and videos. Many of those articles and videos have been produced by people building their first AR. We also know that you expect more from us than to simply follow the crowd of other evil black rifle builders. Fortunately, because we know that, we intend to provide something a little different in this series of article. First of all, we’re experienced. With dozens of AR-15 builds under our collective belt, this is not our first rodeo. You’ll benefit from our experience, learn from our mistakes and, hopefully, pick up a tip or two along the way. Secondly, we’re building a rifle with a specific purpose. We intend to detail that purpose and discuss how each component of the build was chosen to meet that purpose. 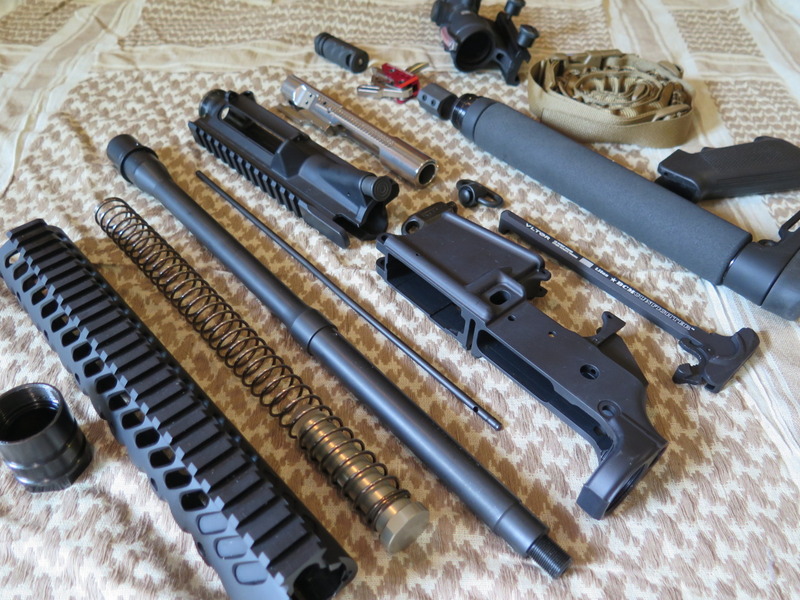 Finally, while there are dozens – maybe hundreds – of articles and YouTube videos with relatively poor photos and shaky, out-of-focus video, there are very few with high quality photos that demonstrate some of the more intricate details of assembling an AR-15. We intend to deliver our usual quality photography to help highlight some of those details. Briefly, we chose the Yankee Hill upper because we’ve built several AR-15’s on these uppers and have had nothing but good performance at a reasonable price. Tolerances are always in spec and everything always installs easily. The Radical Firearms barrel was new to us. We were looking for an accurate barrel that didn’t weigh a lot. “A lot” is subjective but the SOCOM profile is a good, middle of the road profile – in terms of weight – and we had heard good things about the quality and accuracy of the Precision Firearms barrels. This was also our first Melonite coated barrel. Supposedly the Melonite coating supposedly increases the hardness of a barrel while decreasing the amount of expansion during the coating process when compared to chrome lining. A chromed barrel must be over bored to allow for the lining which typically leads to a barrel with looser tolerances than those of a Melonite barrel. We met the guys from Fail Zero at SHOT Show in January and wanted to give one of their NiB (Nickel Boron) bolt carrier groups a try. Bravo Company’s MOD4 charging handle is pretty much our standard when we build AR’s. We saw no reason to mess with success here. It’s nice to have a familiar feel to and placement of the major operating components of a rifle being used in competition. We’ve also become a fan of Diamondhead’s handguards. They have a unique look, simplified mounting hardware (no barrel nut tuning required) and have never given us a problem. Precision Armament’s M4-72 compensator had seen some good press, both in terms of performance and value, so we decided to give it a try. The gas block and tube, buffer and buffer spring were chosen based on past experience and value for the money. As we contemplated this build, there was no question as to which trigger to run. The RISE Armament RA-535 trigger is a thing of beauty. It’s installation is simplistic. It’s performance is fantastic. We’ll take a closer look at this trigger in the lower build article in this series but suffice to say the RA-535 is a race gun trigger for your AR. We found a deal on “blemished” Spike’s stripped lowers and have never had a problem with them in the past so we picked up one with Spartan markings for this build. To keep the weight down, we chose the ACE Ultra Light stock. As far as we know, it is still the lightest stock on the market. 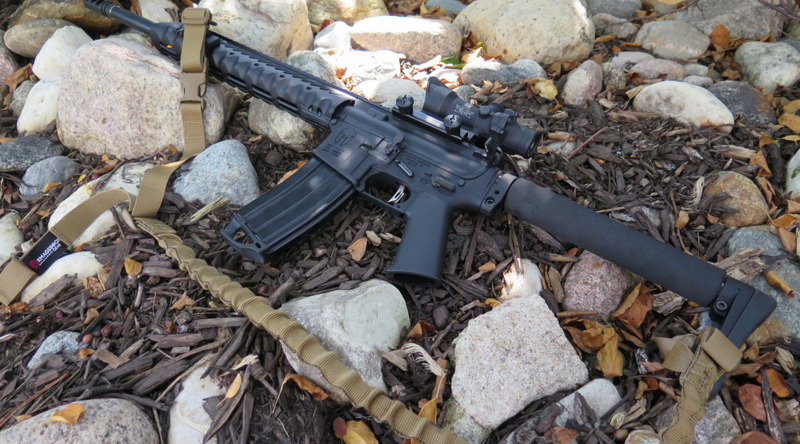 In keeping with the relatively lightweight design, we chose a Magpul K Grip pistol grip. Much like the ACE Ultra Light stock, we believe the K Grip is the lightest pistol grip on the market. Finally, we used most of the parts from a Palmetto State Armory lower parts kit to accompany the RISE Armament trigger inside the lower. Although the ACOG optic nearly doubled the price of this rifle, we feel it was well worth the investment. If you’re counting on a rifle in a competition … or to keep you alive … you want the best glass you can afford with the fastest aiming possible. In our opinion, ACOG optics are winners in both categories. After meeting and competing with Tom Fuller, the owner of Armageddon Gear, they have become a go-to source for slings, cases and other firearms-related soft goods. Their carbine sling is no exception. The Daimondhead rail section was chosen to match the Diamondhead handguard which is not a quad rail handguard. The Magpul QD sling swivel rail mount and GovTec swivel are proven performers. Stay tuned for the next article in this series: Building the Run and Gun Upper.